The Extreme Mustang Makeover is a program presented by The Mustang Heritage Foundation and the BLM (Bureau of Land Management). One hundred trainers from all over the country will be picking up a BLM Mustang between June 6-8. They will have until September 22 to work with their allotted horse and then present the Mustang in Fort Worth Texas. The horses will be judged on overall condition, behavior on the ground and under saddle and ridden through a trail/obstacle course. The horses will then be auction off on September 23. 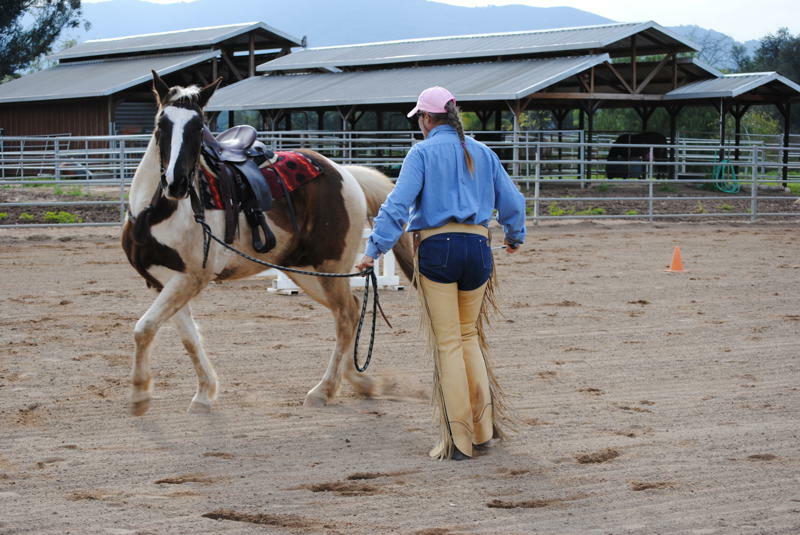 Kathe Smothers of Quiet Mind Horsemanship was one of the trainers selected for the program. Kathe was emailed the application from her friend Neda DeMayo of Return To Freedom a wild horse sanctuary in Lompoc Calif. Kathe works with some of Return To Freedoms young horses starting them under saddle and on the trail with the hopes of finding them foster homes. Kathe went through the selection process which began with 400 + applications. On May 9th, she was notified she had been selected. Kathe’s first experience with Mustangs began at the age of 11. She spent several summers at family friends ranch in Strawberry Nevada, while visiting they would round up the horses that roamed on the million + acre ho”Horse Trainer Kathe Smothers of Quiet Mind Horsemanship”mesteaded property and castrate the young stallions, brand the horses, check for injuries, worm, and medicate the horses. At that time all horses roaming on a persons property was considered that persons possession. It was an amazing experience for a young girl. Each summer Kathe was able to pick one of the young horses from the herd and keep it up to learn to start and work with these amazing animals. Kathe was reintroduced to the Mustangs in 1999 when she and her husband attended a BLM adoption at the Ventura Fairgrounds. There she adopted 2 horses and her journey with these amazing horses continues today.